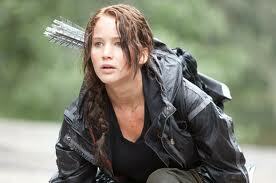 I love The Hunger Games. We both do, here on this blog. It’s no surprise – Katniss is an outstanding, unbelievably Slatebreaking character. From her fierce loyalty to her family, her amazing survival skills, her ability to outsmart almost anybody and the complexity of her emotions, she’s and incredibly fascinating and admirable heroine. I first read the book in 2008 and have been pushing it upon my friends with an almost alarming urgency ever since. Last Thursday, Brianna and I went to see the movie at midnight with nearly 30 of our friends. I’ve probably spent a solid 30% of my awake time talking about The Hunger Games in the past week. And I could not be more excited that this movie, based on a YA book, that passes the Bechdel test with flying colors, with a complicated and capable female heroine as the star, is on track to break box office records and be a major hit. It’s been particularly exciting, all of this enthusiasm surrounding this book series, because, you guys, I am this excited about YA Literature and awesome female characters all the time. I spend a huge portion of my time thinking about it. So for everyone I know, from my coworkers to my mom, to be just as excited about it right now – that’s amazing. And also, I have no serious love for Twilight. While yes, I have read all of the books and seen all of the movies, I didn’t enjoy them all that much and I have real problems with the way women and romantic love between men and women are portrayed in them. Some of it has been downright appalling. I cringe as much as the rest of the feminists by the way the book suggests marriage at 18 as the ultimate happiness and the lack of depth in the characters and relationships. It came up over and over again as I read about The Hunger Games. Excitement over this movie blended with eye rolling and derision for the Twilight saga. But what these posts are ignoring is the fact that without a doubt, the success of Twilight paved the way for The Hunger Games. Regardless of my feelings on Bella/Twilight, a female driven movie with huge box office numbers made it possible for this movie to happen. Twilight made millions of dollars – literally – and because of a female driven audience. I know that now, The Hunger Games has its own rabid following, but back when the movie was given the green light, and when it was given all of these advantages that are given to anticipated blockbusters, it didn’t have the same kind of fan base. I truly believe that this movie, based on a YA book with a female protagonist would never have been given this kind of consideration without the success of the Twilight franchise, without the corporate box office understanding that women audiences are an important part of the market. The Hunger Games had a huge opening weekend – 3rd best of all time and the best ever of a non-sequel film. There’s no question that at this point it stands on its own, and I can’t wait to see what this paves the way for next. But it is worth remembering what helped set its success in motion, before it had it’s own notoriety. But the real problem, I think, lies with the danger of comparing these two movies as though they exist in a bubble by themselves. Because they are two successful movies based on YA books, of course they are a natural comparison. But there is a certain danger in this kind of constant, direct comparison between Twilight and The Hunger Games and by extension, between Bella and Katniss. Passive versus active. Love versus activism. Waiting to be rescued versus fighting for your life. And I get drawn into this kind of thinking, and I want to shout Team Katniss from the rooftops, declaring my utter joy that this heroine is as popular as she is. BUT. This constant, direct comparison suggests a complete dichotomy. It suggests that these two things are the only things out there. If you’re not a Katniss, then, this kind of thinking suggests, you’re a Bella. But those of us who read a lot of YA lit know full well that there are a huge spectrum of fascinating young female protagonists. In addition to Katniss and Bella and Hermione, we have Frankie Landau Banks, Saba, Katsa, Karou, Jessica Darling, The Penderwicks, Gemma Colon, Hazel Grace Lancaster, Vera Dietz, Amber Appleton and a million other amazing, complicated, young women who have populated YA shelves for decades and redefined what it means to be a teenage girl over and over again. So when you compare Katniss and Bella, think about what that really means. Love or hate them, let’s analyze these characters and stories on their own merits. This entry was posted in Use Your Gray Matter and tagged Bella, Fandom, Feminism, Katniss, Movies, The Hunger Games, Twilight, use your gray matter. Bookmark the permalink. THANK YOU for this! We ventured into Toys R Us for the first time a few weeks ago and found ourselves standing between the “pink princess” aisle and the “goth girl” aisle and thinking, “Are these the only two options for our baby girl?” It isn’t either or, and in terms of advancing the feminist movement (and let’s be honest, we still have work to do) we’ll get a lot further together than divided. And PS: I loved The Hunger Games movie and can’t wait for the next one. Thank you for letting me be one of the friends you forced the books upon! Toy choices for girls is really beginning to become an issue as more and more of the princess perfect image is being pushed onto them at an extremely early age. I’ve just finished reading a book titled “Cinderella Ate My Daughter”. It raises all sorts of issues about the media, toys, pink culture and body image. It unfortunately, doesn’t give parents and educators a way to really deal with it (if there is one really), but it makes you very aware about things that you may not even be noticing now. I highly recommend it. Slatebreakers recommendations are a good start to dealing with the princess stuff, but I am looking forward to the book that provides some more concrete ideas. How about that new Pixar movie, Brave? Fighting princess? Not sure how I feel about that yet. LOVE Cinderella Ate My Daughter – I thought it was a really great perspective, and gave me a new lens to think through. Can’t wait to hear what you think of the HG movie. Yeah, exactly! Tough girls are great, but it gets dicey when paired as polar opposite (and potentially only alternative) to princess. We need a broader conversation. Thanks for the post. Hoping to see the movie tomorrow … if not tomorrow then really soon!! I’m so excited and have only heard great things about it.